Posts that can go on the front page. Therefore, the phase shift of this interferometer is not determined by the local acceleration along a single populated trajectory, demonstrating that the atomic wavefunction is a nonlocal probe of the spacetime manifold . Thus they have experimentally shown that wave functions feel gravity pretty much where they ‘are’ in real space ( try not to think of configuration space at this point! ). No one really doubted this would happen. Still, it leads one to wonder what about the other side – the backreaction – to this. Do the atoms in the Asenbaum experiment source gravity in the same way they detect it? It would seem obvious that they should, but no one has done an experiment to verify this (see later in this article). That is, the gravitational centre of mass coordinate,xi, of each particle is continuously measured and a classical stochastic measurement record, Jk(t), carrying this information acts reciprocally as a classical control force on the other mass. In other words in the KTM model, the source and detection channels for a particle are both as in semi-classical gravity. The expectation value of the particle’s is the mass location for both source and detection. You can sense that the Asenbaum experiment shows KTM does not work – the experiment shows that atom, which is in a dual humped wave function with a separation of centimeters cannot be seeing only the average field – the wave function senses the curvature. The paper by Altamirano, Corona-Ugalde, Mann, and Zych Gravity is not a Pairwise Local Classical Channel , confirm these feelings about KTM – like theories. They don’t work. Here we show that single-atom interference experiments achieving large spatial superpositions can rule out a framework where the Newtonian gravitational inter-action is fundamentally classical in the information-theoretic sense: it cannot convey entanglement. Specifically, in this framework gravity acts pairwise between massive particles as classical channels, which effectively induce approximately Newtonian forces between the masses. So gravity is not truly semi-classical. No surprise to me, or to the quantum gravity workers (LQG, String Theory, etc). What many/most quantum gravity people like to think, however, is that KTM or similar (Diosi – Penrose), Rosenfeld like semi-classical gravity basically exhaust the spectrum of classical gravity theories. The papers describing the BMV experiments by Bose et al., Marletto and Vedral, and Christodoulou and Rovelli. ...detecting the [BMV] effect counts as evidence that the gravitational field can be in a superposition of two macroscopically distinct classical fields and since the gravitational field is the geometry of spacetime (measured by rods and clocks), the BMV effect counts as evidence that quantum superposition of different spacetime geometries is possible, can be achieved..
A problem I see in these BMV papers is that they all use the predictions of semi-classical theories (not KTM but semiclassical as a source only) as a classical test case, without much thought to the predictions of other ‘classical’ theories of gravity. The possibilities are many and the experimental consequences are not simple. Finally, although we regard the Bohmian semi-classical approximation for quantum gravity as an approximation to some deeper quantum theory for gravity, one could also entertain the possibility that it is a fundamental theory on its own. At least, there is presumably as yet no experimental evidence against it. Each run of the experiment has particles in any one of 4 configurations, – the trajectories. There is no superposition of gravitational fields – each run has a different gravitational field configuration. The resulting experimental statistics show entanglement – even though gravity is classical throughout. The last point is the most surprising. We look at why an experimenter will see entanglement with Bohmian trajectories. At the heart of the argument is the fact that while these Bohmian trajectories look very classical, they are actually quantum – more clearly subquantum aspects of (Bohm/de Broglie) quantum theory. So we have a situation where we can get behaviour very similar – ( i.e. 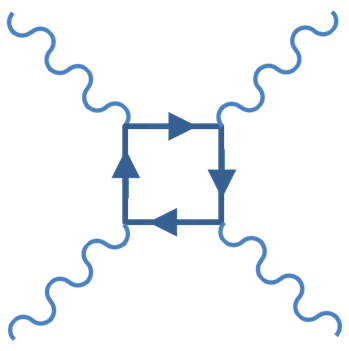 showing entanglement ) to quantum gravity for the BMV experiment by using classical gravity coupled to Bohmian trajectories, where there is a superposition of gravitational fields – but only in the boring classical histories of the experiment viewpoint. Since the experimenter has only histories to look at, showing that the gravitational field was in a superposition requires more than merely observing some level of entanglement in the BMV experiment. This is a paper version of the poster I presented at EmQM17 in London. Some physicists surmise that gravity lies outside of quantum mechanics. Thus theories like the standard semiclassical theory of quantum to gravity coupling (that of Rosenfeld and Møller) are possible real models of interaction, rather than a mere approximation of a theory of quantum gravity. Unfortunately, semiclassical gravity creates inconsistencies such as superluminal communication. Alternatives by authors such as Diósi, Martin, Penrose, and Wang often use the term ’stochastic’ to set themselves apart from the standard semiclassical theory. These theories couple to fluctuations caused by for instance continuous spontaneous localization, hence the term ’stochastic’. This paper looks at stochastic gravity in the framework of a class of emergent or ontological quantum theories, such as those by Bohm, Cetto, and de Broglie. It is found that much or all of the trouble in connecting gravity with a microscopic system falls away, as Einstein’s general relativity is free to react directly with the microscopic beables. The resulting continuous gravitational wave radiation by atomic and nuclear systems does not, in contrast to Einstein’s speculation, cause catastrophic problems. The small amount of energy exchanged by gravitational waves may have measurable experimental consequences. A very recent experiment by Vinante et al. performed on a small cantilever at mK temperatures shows a surprising non-thermal noise component, the magnitude of which is consistent with the stochastic gravity coupling explored here. I have made a simple calculator to calculate the flux in watts per square metre of gravitational waves given a frequency and a strain. The idea is to show how easy it would be to hide cosmologically important amounts of energy in high frequency gravitational waves. If we take values of a strain of 15 orders of magnitude lower than LIGOs sensitivity, and a frequency of the Compton frequency, we get levels of energy flux and density that are very surprising. No one talks about this, though, since HFGWs are ‘known’ not to exist. I posit that we should not assume anything about gravitational waves at this point. Its an obvious place for experimentalists to work in. Are there any experiments that can detect gravitational radiation at millions of watts per square meter and nuclear frequencies? This is something that experiments should decide. The accepted spectrum of gravitational waves does not include the possibility of high-frequency waves. Just think about it – there is no way we can tell – there may be billions of watts of gravitational wave energy passing through your body right now. They may be there, waiting for us to find them. How can ‘dark matter’ be gravitational wave energy? Dark Matter is measured as an excess of mass/energy – as it’s presence is determined by gravitational effects on regular matter. In fact- experimentally, dark matter is too tied to matter – one can predict the amount of dark matter in a galaxy or galaxy cluster, etc by simply writing down the total mass distribution of baryons! What we know of dark matter is that it’s weakly coupled to matter and that it’s much denser than the level of dark energy that is spread throughout the universe. Dark Matter is gravitational waves associated with matter. Call it DarkGW. It looks like the presence of matter controls the amount of dark matter present and DarkGW interacts very weakly with matter (perhaps not in a linear fashion? ), perhaps even violatiing the rules of quantum mechanics – after all there is no quantum theory of gravity yet. In this scenario, dark energy is the ‘leaking’ of this DarkGW into intergalactic space. Thus there is a source for DE and it does not have to have a transcendental source. Its ‘just’ regular radiation – radiation that does not redshift as the Universe ages, as the redshifted bits are replaced on a continual basis by the DarkGW. This tells us why the amount of DarkGW is related to the amount of Dark Energy (why are they within a factor of two of each other?). As the DarkGW has leaked out, the Universe has expanded. Once the galaxies start to get cold and far apart (say in 200billion years) – the dark energy would start to redshift, and the Universe would approach a ‘balance point’ universe instead of a runaway expansion as in modern LCDM. Riess says that it could be caused by hypothetical “sterile neutrinos”, interactions with dark matter, or a strengthening over time of dark energy (which accelerates the universe’s expansion). Sterile Neutrinos are a last ditch effort to keep dark energy as a parameter (Lambda) in Einstein’s equations. Its clear to me that the best answer is that dark energy is getting stronger over time. Dark Energy is on the right side of the Einstein equations, not the left. Lambda was a mistake. Its zero. The problem with dark matter in galaxies is that it’s just too organized. Dark matter seems to correlate too well with matter distributions. What about a field associated with every nucleon that saturates at some level, called S here. (its saturated near dense matter like here on Earth or in the Milky Way plane, while when protons/neutrons get below a certain density, the field then eventually drops as the density of matter drops. This solves the cuspy galaxy core problem, it also makes the BTFR (Baryonic Tully Fisher Relation) work, it also seems it would work on the bullet cluster, galactic clusters, etc. With the S field presented here, there is a saturable field associated with every nucleon. When nucleons are about a mm apart or less on average, the S field is at some standard strength, then as the density lowers more, the S field maintains its density (or slowly loses density) until at some limiting low matter density this saturable field S starts to drop. By the point this happens there is ~100x more energy in the saturable field S than the baryonic density. This effect can explain the BTFR as dark matter is present in quantities as a function of baryonic mass in some fashion. The bullet cluster poses a problem for MOND like theories – there seems to be excess dark matter causing lensing. So dark matter really exists, it seems. The S field solves this nicely. No one thinks that the lensing areas of the Bullet cluster are completely free of matter, it’s just that the dark matter is not located where the bulk of the matter is. The contours show the density (line of sight) of dark matter, while the X-Ray image in orange – purple shows the colliding dense regular matter. Clusters of galaxies would not hold together without about 5 times the mass of the individual galaxies available between the galaxies to hold the galaxies together. See Galaxy clusters prove dark matter’s existence as an intro by Ethan Siegel . The mechanism is clear – the intergalactic dust and gas provide the framework to energize a large S field which keeps the cluster gravitationally bound. The S field is associated with matter and has a limiting high density. At low densities (ie halo galactic densities) the field has a mass of up to about 10 (or 100?) times the mass of a nucleon, per nucleon. Where does the energy come from? It’s dark energy – just clumped. So S is dark energy. There is always a flow of it running around, and its pulled from dark energy as needed to saturate around matter. What is the form of the field? What is the minimum energy density in say GeV/m3 ? Dark Energy has an energy density of about 0.5 GeV/m3 . The max is determined by the maximum density measured for dark matter which is about 0.5 GeV/cm3 (note the centimeter scale used by astronomers when dealing with matter clouds) see my earlier related post Is Dark Matter merely Inactive Matter? so about 1003 or a million times the density of dark energy. Thus the S field saturates at a density of ~ 5e5 GeV/m3 and is present all around us. The S field density is then some function of the matter density. It turns out that it’s a cumulative effect from all matter enclosed inside ‘R’. Consequently, the dark matter contribution is fully specified by that of the baryons. The observed scatter is small and largely dominated by observational uncertainties. This radial acceleration relation is tantamount to a natural law for rotating galaxy. Thus the quantity of DM inside a certain radius is wholly dependent on the amount of baryonic matter inside that radius. The S field is a cumulative effect of density of regular baryons. This equation states that the density of dark matter depends only on the enclosed average density of baryonic matter. Calculating the acceleration at R , given a 35kPc distance R, and a density of baryons of 1GeV per cm3 gives = 1.2×10-10 m/s2 – ie which is the Milgrom acceleration. So that’s the cut where dark matter starts to be apparent, as the denominator starts to take off. Of course, this density equation has limits on both ends. The dark matter S field has a maximum density of about a GeV per cm3 and once the density goes down to about dark energy levels one no longer calls it dark matter. Don’t forget my density version of the equation requires the average density inside R for the galaxy/gas cloud/cluster. In my mind this S field is HFGW, but it’s not important what is the nature of the field, vs the mass of the field. It seems to me that battling it out as MOND vs LCDM is perhaps not the best way to approach the problem as there are obviously more models around that might work. One just has to throw out some part of standard model physics! Looking at the above more, I’m not convinced that sticking exactly to the MOND formula for mass and density is the way to go with this S field idea. I’m hoping there is a function where the density of DM is only given by the local density of matter, but perhaps that will not work. Perhaps there is something happening where DM depends on the total SUM of all all the matter interior to the radius R.
The Tully-Fisher relation (aka Baryonic TFR) is remarkable. As the diagram below shows, the relationship between Vf and the baryonic mass of galaxies is just too finely tuned to be caused by dark matter. Something is up. Vf is the stellar orbit velocity in the galactic halo. For more details see the paper by Lelli, McGaugh and Schombert . MOND (MOdified Newtonian Dynamics) is one explanation for the Tully-Fisher relation. It posits that the force towards the centre of a galaxy at large distances is not simply that of Newton, but is modified with the a0 of 1.2×10-10m/s2 in all galaxies in addition to the usual force predicted by standard Newton or General Relativity’s gravity. LCDM Dark matter is a clumsy explanation for the BTFR, as it needs fine tuning for every galaxy (or every galaxy type) in order to make that straight line be so, well, straight. There is another way to generate an inward acceleration. We need a force on each nucleon that changes with how much matter is inside the radius where the particle is. It somehow ‘knows’ the gravitational potential at R, and has a force that depends on that! What I have so far on this is something to do with dark energy being more concentrated in galaxy cores, so the particle feels this dark energy slope and responds to it. NOTE: This needs to include a dependence on the enclosed M (ie enclosed Dark Energy inside R). I call this emission based acceleration ‘Anomalous radial nucleonic radiation’ (ARNR). MOND tells us that particles in the galactic halo can ‘weigh’ the galaxy. They have that information. So there must/might be something like dark energy concentrated in the galaxy and the particles react to this, pushing radiation outward and reacting inward. Note in the galactic core the divergence of the DE is 0 – so no extra force on the particle in the middle of the galaxy. It might seem strange to have this concerted outward radiation pattern though! Here are some possible explanations for an outward constant radiation by the halo constituents. I’m a fan of super high (nuclear and above) frequency gravitational wave (HFGW) emission/absorption in atoms and nuclei. So we might have some sort of stimulated emission from nucleons based on the outward flow of HFGW out of a galaxy. Dark Energy has a value of about 1GeV/m3 . If this energy is concentrated by the galactic core, then maybe some the nucleon has a force toward the centre of the galaxy in response to the divergence of the DE field. (i.e. lower radiation resistance in the outward direction). This Dark Energy may be some new field, (or HFGW). Some other mechanism. We don’t have to know the mechanism to predict some consequences. People don’t generally like the MOND theories because general relativity (GR) in its usual form is so well tested and accurate. LCDM is disliked by many because of the fine-tuning required in order to get everything to match observations. ‘Anomalous radial nucleonic radiation’ (ARNR) allows GR to exist as is. If nuclei really do radiate continuously, (perhaps in violation of quantum – mechanics) then there will be experimental consequences. These consequences may be largely hidden from earth-based experiments, as the emission would be isotropic and take place in some field (such as gravitational waves) that is hard to detect with current instruments. There may be other places where cosmological or galactic cluster observations might note this energy output. In other posts, I have wondered if dark matter is ‘sleeping regular matter‘ and I still think that it may be a viable option, but it seems like any explanation in terms of dark matter may need to be fine-tuned to match observations. I’m headed to London for the EmQM 2017 conference Oct 26 – 28 2017, which will I am looking forward to. When I first really understood what quantum mechanics really was – in second-year undergrad at the University of Toronto, I immediately read all sorts of books and papers by and about Bohm’s theories. He made quite a change in my outlook of physics in general. I became convinced in 1985 that quantum mechanics was incomplete and that something along the lines of Bohm’s theory was the way to go. That makes the conference more special for me, and I’m sure many other attendees share the same view. I am presenting a poster which I’m still polishing that up right now (the abstract at least was well received!). Its based on a paper called ‘Fully Classical Quantum Gravity (see link)‘. I have renamed the poster to Stochastic Gravity and Ontological Quantum Mechanics and rewritten most of it. The finite intercept, clearly visible in the inset of Fig. 3 implies that the data are not compatible with a pure thermal noise behavior, and a nonthermal ex-cess noise is present. The paper details the careful procedures followed to chase down possible experimental problems. The analysis is carefully thought out. The paper claims the results show a possible signature of Adler’s Continuous Spontaneous Localization (CSL), but to me it seems like if the results hold up that its simply a great puzzle to solve! My take (in line with the ‘Fully Classical Quantum Gravity‘ paper) is that this noise is caused by the continuous emission and/or absorption of gravitational waves at nuclear frequencies. So LIGO can see gravitational waves with a flux of about , while at nuclear frequencies like , the same formula yields an incredible – another way to look at that flux is that it represents 400+ kg! of mass per square meter per second! I propose that results like this suggest that matter itself can be made of nothing but elaborate patterns of gravitational structures. Clearly, high-frequency gravitational structures can hold an incredible amount of energy. Another way of thinking about this result is that anytime a better telescope is built, or one is built that looks at a new wavelength, field or pattern of signals, those signals are not only discovered, they produce deep new insights about our universe. The fact that HFGWs are hard to detect does not mean that they are not there! Indeed, instead of calculating what the flux of HFGWs might be around us, we should instead admit our ignorance and calculate what we don’t know. Huge amounts of gravitational wave energy could be whipping by everything right now and we would not know a thing about it. It’s going to be a quick few days in London! Which of course is what I have been saying all along. Of course Susskind’s paper is actually ‘of course’ not about QM emerging from GR, which is what I believe, and have good reason to follow up on. its logical conclusion? It is said that general relativity and quantum mechanics are separate subjects that don’t fit together comfortably. There is a tension, even a contradiction between them—or so one often hears. I take exception to this view. I think that exactly the opposite is true. It may be too strong to say that gravity and quantum mechanics are exactly the same thing, but those of us who are paying attention, may already sense that the two are inseparable, and that neither makes sense without the other. Instead of that happening, it seems that the field is moving ever forward in a post-modern direction I can’t follow. Tonight the arXiv has something new from Susskind about this, where he argues that one should go beyond “ER=EPR”, to “GR=QM”. While the 2013 paper had very few equations, this one has none at all, and is actually written in the form not of a scientific paper, but of a letter to fellow “Qubitzers”. On some sort of spectrum of precision of statements, with Bourbaki near one end, this paper is way at the other end. Susskind also says lots of his usual wrong statements resulting from a deep misunderstanding of quantum mechanics – e.g. that "quantum mechanics is the same as a classical simulation of it". A classical system, a simulation or otherwise, can never be equivalent to a quantum mechanical theory. The former really doesn't obey the uncertainty principle, allows objective facts; the latter requires an observer and is a framework to calculate probabilities of statements that are only meaningful relatively to a chosen observer's observations. My take is about the same as these popular bloggers. Don’t really think much of it. Except the title. QM can, I believe, emerge from Einstein’s General Relativity, in much the same way that Bush and Couder’s bouncing drops can display quantum behaviour. My research gate page has more. Its ridiculous that 11 dimensions and sparticles have hundreds of times more study than fundamental emergent phenomena. Emergence is the way to go forward. You don’t need a new force/particle/dimension/brane to make fundamentally new physics from what we already have in electromagnetism and general relativity. See the search links on the side of this blog for some recent papers in these areas. An observer far away from a black hole sees photons of normal infared or radio wave energies coming from a black hole (i.e. << 1eV). If one calculates the energies that these photons should have once they are in the vicinity of the black hole horizon, the energy is becomes high – higher than the Planck energy, exponentially so. Of course if we ride with the photon down to the horizon, the photon blue shifts like mad, going ‘trans-Planckian’ – i.e. having more energy than the Planck energy. Looked at another way: if a photon starts out at the horizon, then we won’t ever see it as a distant observer. So it needs to start out just above the horizon where the distance from the horizon is given by the Heisenberg uncertainty principle, and propagate to us. The problem is that the energy of these evaporating photons must be enormous at this quantum distance from the horizon – not merely enormous, but exponentially enormous. A proper analysis actually starts the photon off in the formation of the black hole, but the physics is the same. Adam Helfer puts it well in his paper. Great clear writing and thinking. My take is simple. After reading Hefler’s paper plus others on the subject, I’m fairly convinced that black holes of astrophysical size (or even down to trillions of tons) do not evaporate. Let’s get things straight here: the math behind Hawking evaporation is good: Hawking’s math for black hole evaporation is not in question. It should be emphasized that the problems uncovered here are entirely physical, not mathematical. While there are some technical mathematical concerns with details of Hawking’s computation, we do not anticipate any real difficulty in resolving these (cf. Fredenhagen and Haag 1990). The issues are whether the physical assumptions underlying the mathematics are correct, and whether the correct physical lessons are being drawn from the calculations. Yet Hawking’s prediction of black hole evaporation is one of the great predictions of late 20th century physics. So it’s an important concept. In fact it so important that much of not only black hole physics but quantum gravity and cosmology all use or even depend on black hole evaporation. Papers with titles like “Avoiding the Trans-Planckian Problem in Black Hole Physics” abound. The trans-Planckian problem is indicative of the state of modern physics. There are so many theories in physics today that rely on an unreasonable extrapolation of the efficacy of quantum mechanics at energies and scales that are not merely larger than experimental data, but exponentially larger than we have experimental evidence for. Its like that old joke about putting a dollar into a bank account and waiting a million years – even at a few per cent interest your money will be worth more than the planet. A straightforward look at history shows that currency and banks live for hundreds of years – not millions. The same thing happens in physics – you can’t connect two reasonable physical states through an unphysical one and expect it to work. The trans-Planckian problem is replicated perfectly in inflationary big bang theory. The trans-Planckian problem seems like a circle the wagons type of situation in physics. Black hole evaporation now has too many careers built on it to be easily torn down. Some may argue that other researchers have solved the trans-Planckian problem, but its just too simple a problem to get around. One way around it – which I assume is what many researchers think – is that quantum mechanics is somehow different than every other physical theory ever found, in that it has no UV, IR, no limits at all. In my view that is extremely unlikely. Quantum mechanics has limits, like every other theory. Zero point: Perhaps there is a UV cut – ( Λ ) . The quantum vacuum cannot create particles of arbitrarily large energies. Instant collapse. While its an experimental fact that QM has non-local connections, the actual speed of these connections is only tested to a few times the speed of light. Quantum measurement – Schrödinger’s cat is as Schrödinger initially intended it to be seen – as an illustration of the absurdity of QM in macroscopic systems. If there is a limit on quantum mechanics – that QM is like any other theory – a tool that works very well in some domain of physical problems, then many many pillars of theoretical physics will have to tumble, black hole evaporation being one of them. The other argument – Unruh saves evaporation? Where does Hawking radiation originate? A common picture is that it arises from excitations very near or at the horizon, and this viewpoint has supported the “firewall” argument and arguments for a key role for the UV-dependent entanglement entropy in describing the quantum mechanics of black holes. However, closer investigation of both the total emission rate and the stress tensor of Hawking radiation supports the statement that its source is a near-horizon quantum region, or “atmosphere,” whose radial extent is set by the horizon radius scale. So after I wrote this I am not convinced that holes don’t radiate. Adam’s argument is below. Basically in order for Unruh’s/Giddings ‘saving’ of black hole radiation to work, there has to be enough ‘source space’ around the black hole to generate the Hawking radiation. There might be. Einstein it would seem was wrong on the gravtitational side of this. The paper looks at possible ways to see these tiny emissions (nuclear scale emissions are higher) and thus lays out a quantum gravity experiment achievable with today’s technology. The experimental parameter space. Most important thing to note is that this is a quantum gravity experiment with an achievable parameter space! In this two page paper, I look at how the relationship between the dimensions of a Kerr singularity and the strength of the electric Coulomb effect compare. a) Quantum Mechanics emerges from General Relativity. b) The Cosmic Censorship Conjecture is wrong. Since the physical behavior of singularities is unknown, if singularities can be observed from the rest of spacetime, causality may break down, and physics may lose its predictive power. The issue cannot be avoided, since according to the Penrose-Hawking singularity theorems, singularities are inevitable in physically reasonable situations. Still, in the absence of naked singularities, the universe, as described by the general theory of relativity, is deterministic  —it is possible to predict the entire evolution of the universe (possibly excluding some finite regions of space hidden inside event horizons of singularities), knowing only its condition at a certain moment of time (more precisely, everywhere on a spacelike three-dimensional hypersurface, called the Cauchy surface). Failure of the cosmic censorship hypothesis leads to the failure of determinism, because it is yet impossible to predict the behavior of spacetime in the causal future of a singularity. Cosmic censorship is not merely a problem of formal interest; some form of it is assumed whenever black hole event horizons are mentioned. The above description is more or less the way that its viewed today. If like me, you think that Cosmic Censorship is false, then the above reads as to how fundamentally acausal – ‘truly random’ events can emerge from a purely geometric universe. This does not sound like a catastrophe at all. It sounds like nature. The Kerr solution plainly admits a > m . The number of papers trying to figure out how a > m cannot exist far surpasses the ones that simply explore the consequences of a > m naked singularities. These over spinning Kerr singularities are in fact fairly benign it turns out as they are impossible to hit unless one shoots a test particle along the exact equator – a set of measure zero. (Carter 1968). Many of the papers concerning the non existence of a > m use a thought experiment along the lines of ‘starting with a ~= m, toss in a rock so that it looks like a > m will be the result’. They then go to great lengths to show that back reaction, etc will keep a <= m. That misses the point. There are also ways to construct a naked Kerr ring using wholistic methods like collapsing rings of matter, or colliding gravitational waves. Thus a > m can happen. See https://arxiv.org/abs/1509.05174 for example. Get over it. Kerr spinning a > m solutions likely exist in nature. Physics is broken. Worse than we think. A couple of months ago I read Jim Baggot’s Farwell to Reality. I was very impressed. I won’t go into details, but the book takes the eminently reasonable suggestion that 11 dimensions, uncountable infinities of universes and other mainstream theoretical physics subjects are “fairy tale physics”. Physics really needs people like Jim Baggot, Peter Woit, and Lee Smolin to show that the emperor has no clothes. But what if things are far worse than these authors report? So I went looking for other writing critical of modern physics. Did I find it. I read two of Alexander Unzicker’s books. The Higgs Fake and Bankrupting Physics. They are a great read, whether you agree with him or not(caution – unintended hilarity). As if to underline the mindset of the physics community at large, after writing these two books Unzicker had trouble with arXiv, and has several more stories about the negative reaction of this closely knit society to outside criticism. One fact about criticism is that people get most upset when the criticism strikes close to the truth. Peter Woit’s criticism of Bankrupting Physics revolves around trying to classify Unzicker as ‘a garden-variety crank’ – which of course then makes Woit’s job easy as it automatically discounts everything he says (unless he is in agreement with Woit of course). My take is simpler: Woit’s book and blog regularly complains about string theory and the multiverse being bunk, which in my opinion is something like 99.9999% likely to be true, while Unzicker’s assertions are ‘only’ 10 – 99.9999% likely to be true. Contrast that with the 50,000 papers on supersymmetry – each one of which is a 100% waste of time according to both Woit and Unzicker. Peter Woit can be wrong too. There are other areas of physics that smell as bad as String Theory. The Ligo measurement is the greatest thing to happen in Physics and Astronomy for decades. Amazing work. It was about 50 years ago that the first gravitational wave detector was built by Weber. It took 50 years of refinement, many PhDs postdocs and full careers, but the LIGO team did. it. The enormous gravitational wave energy emitted. How much energy? Three solar masses worth of gravitational waves were emitted over just a few tenths of a second. The paper reports a peak gravitational energy emission of 200 solar masses per second! See the paper for errors on this estimate but its accurate to within 20%. The really amazing thing though is that this emission took place from a region only about 200 km across. The frequency of the waves at peak emission is (from the paper fig 1 – bottom row) 120 Hz or so. Lets look at that amount of energy in terms of another form of energy that we are more comfortable with – electromagnetic waves – light. I want to compare this to the “Schwinger limit” – which is the maximum electromagnetic field that can occur before quantum pair creation effects take over. The Schwinger limit controls the maximum power that a region of space can transmit through itself (via opposing overlapping lasers say). Say we had standing radio waves at 120Hz in a 200km on a side box, how much power could such an area radiate if it were only limited by the Schwinger limit? (i.e. ignore the mechanism by which such spectacular amounts of energy could be turned into radio waves). Total Energy density = ε*E2 So at the Schwinger limit of 1.3×1018 V/m and with the constant ε being 8.854187817620… × 10-12 Farads/m, we get 1.5×1025 kg/m/s2. We have 200,000 metres per side, so there are 1.2×1041 J (joules) in a 200km on a side box at the Schwinger limit. How many joules of gravitational wave energy were held in a 200km box around GW150914? Well at 200 solar masses per second emitted, we need to take the size of the box and use light travel time to determine the amount of energy in the box at any one time: So 200 solar masses per second. Light travel time is 200km/(3e8m/s) = 6.7×10-4 seconds. So if that volume emits 200 solar masses of energy per second, then that is 0.13 solar masses worth of energy at any one time in that volume, or 2.3×1046 Joules! This is some 5 orders of magnitude above what can be emitted by this same region using electromagnetic means! The mechanism by which one arrives at the Schwinger limit is conceptually simple – ‘QED non linear photon – photon scattering’ involving electron – positron pair creation. (See the wikipedia article for a start). Is there a corresponding quantum ‘Schwinger limit’ for gravitational waves (gravitons)? Well there is of course a limit in place due to classical general relativity, which is well known. In this case we are close (gravitational h is about 0.001 or so?) of the classical limit, which is basically that you can’t pile anything up so that the density would cause a black hole to form. But is there a feynman diagram for graviton – graviton scattering – well of course there is – it should behave like real classical gravity! I guess what I am wondering – is there another pathway where graviton scattering would take place and according to QM make the GW150914 ‘impossible’? Does the observation of gravitational waves 5 orders of magnitude stronger than the strongest possible electromagnetic wave mean that we can finally stop calling gravity the weakest force? Yes to that! My take as anyone who reads any of this site will know is that electromagnetism, quantum mechanics and the nuclear forces are all emergent phenomena from classical general relativity (see my poster). To me this observation is another hint at what general relativity can do. As a further note, this corresponds to 0.018 watts per square metre at the 1.3 billion LY distance of the earth! That means that the earth had 2.3 Terawatts of gravitational energy passing through it on Sept 14 2015, just from this one event. Yet this massive amount of power is barely within observational limits of LIGO. LIGO sees only nice correlated bumps (with only 2 detectors its not really built to look at the background of gravitational wave energy), so we could easily have this much energy passing through the earth in the form of these stochastic low frequency gravitational waves all the time, and LIGO would not be able to detect it. Gravitational waves make the perfect sub-quantum excitation – they can carry very large amounts of energy without anything but a carefully designed detector being able to pick them up. What would be an ideal detector for LIGO frequency waves? Other than the actual LIGO observatory of course (which I argue below may not be the ideal gravitational wave detector). A nice isolated black hole maximally spinning at near a = 1, and of the same approximate mass as the GW150914 emitter would exchange a substantial amount of the incoming wave energy into motion – and it would pick up something like 0.2 GW of power for a fraction of a second, which would likely be observable since this hypothetical black hole is sitting so nice and quiet, a GJ of energy exchange would cause small (since the thing is so heavy) but measurable effects. Say we don’t have a nearby system (we would need varying sizes to couple to the frequencies we wish to monitor) of quiet black holes to listen to. What else could we build? The ideas opens up if one assumes that matter and light are both gravitational phenomena. What would be ideal is something that mimics a tuned superradiant like interaction with gravitational waves, but it trillions of times lighter and made of ‘ordinary matter’. What makes super radiance work? For my Masters and PhD I worked on the Sudbury Neutrino Observatory, where I worked on the water purification team and also the computer simulation of the detector. It was a great time and I learned a lot from my Supervisor John Simpson at the University of Guelph in Canada. The papers below are SNO collaboration papers, in addition to papers in journals like NIM, where our lab published the details of our ultra low level radon counting experiments. I maintain a list on Research Gate of my publications. Article: Can a sub-quantum medium be provided by General Relativity? Article: Measurement of the rate of nu(e) + d –> p + p + e(-) interactions produced by (8)B solar neutrinos at the Sudbury Neutrino Observatory.